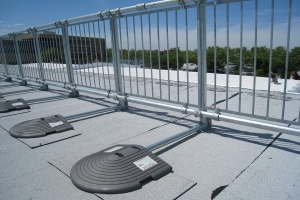 Rooftop guard rail products that provide a safe working environment. 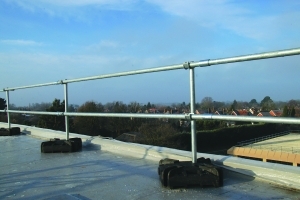 Free standing edge protection plus skylight and roof hatch railing products designed to prevent falls from height. In order to prevent accidents at high altitudes the utilization of collective fall protection is often employed as a precautionary measure to protect people. 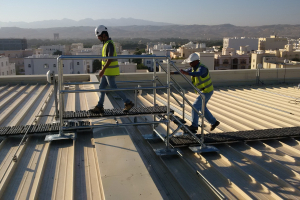 Implementation of blocking devices helps to mitigate accidental falls from dangerous elevations, from an access point, or leading edge, on a roof, building, walkway, or other potentially hazardous location. Whatever the safety application need, an OSHA compliant solution can be found within the Kee Safety categories of collective fall protection products. Explore our collective fall protection products below. 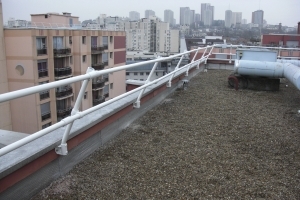 A modular, free standing roof edge railing system that does not penetrate the roof membrane. The KeeGuard system is fully tested and meets or exceeds current safety requirements. Learn more about this system. This system offers a new and innovative approach to portable railing systems. KeeGuard Contractor with new recycled PVC weights is a free standing system, thus it does not penetrate the rooftop or working surface. Learn more about this portable rail system. 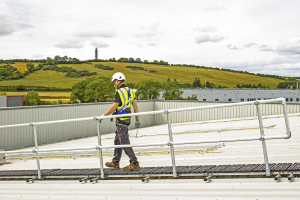 Safe Access Platforms are custom built solutions that meet the specific requirements of your rooftop surface and provide a safe route over pipework, HVAC and other rooftop obstructions. All Kee Safety platforms are engineered to meet OSHA safety standards and designed for maximum durability. Pre-assembled uprights for quick assembly of railing and guardrail.